A writer and a social activist, Albion Fellows Bacon, was born on April 8th, 1865, in Evansville, Indiana. After graduating from the high school in Evansville, she went to work as a secretary since her family could not afford to send her to college. In 1888, she married a banker and merchant from Evansville, Hilary Bacon. After she became a homemaker and had a family with Hilary, Bacon’s desire to use her intelligence for the public good stirred after discovering Evansville’s riverfront slums. Bacon decided to petition against low public housing standards and fight against other social ills that plagued her community. She organized multiple organizations such as the Flower Mission (for poor working women), the Men’s Circle of Friendly Visitors (a group of men involved in the church and civic work), an Anti-Tuberculosis League, and the Monday Night Club, a group of citizens dedicated to charitable works within the community. One of Bacon’s prominent accomplishments was drafting and petitioning for a model Indiana state law that would improve substandard housing. Though it passed in 1909, amendments limited the bill’s effectiveness in Evansville and Indianapolis. However, Bacon’s continued determination led her to organize the Indiana Housing Association in 1911, which successfully pushed through a statewide application to improve public housing in 1913. 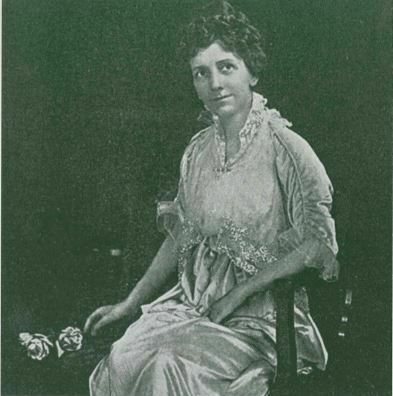 Bacon recorded the experience of leading her campaign in her book, Beauty for Ashes, published in 1914. 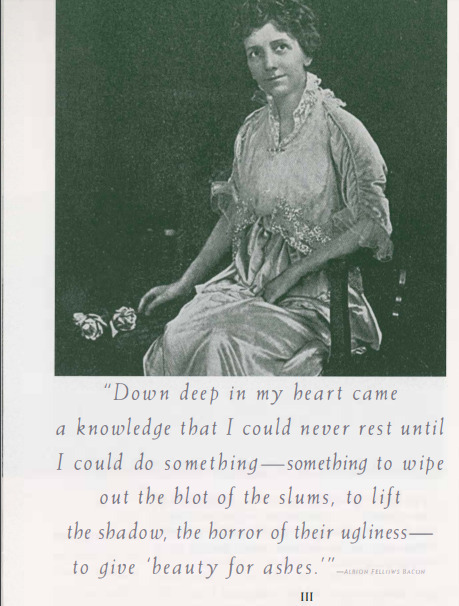 In 1917, she assisted with passing legislation that condemned unsafe and unsanitary housing. Later in life, Bacon continued to serve her community in various forms, from serving as executive on the committee of the Indiana Child Welfare Association to pushing for child labor laws until her death on December 10th, 1933. Albion Bacon’s legacy continues to live on. In the 1970s, a group of concerned citizens from Evansville began a coalition against domestic violence in their community. Inspired by Albion Bacon and all the work she accomplished, they named their non-profit organization after her, the Albion Fellows Bacon Center. Today, this organization continues to serve anyone who is a victim of domestic violence. Abigail Bragg, “Albion Fellows Bacon,” Discover Indiana, accessed April 25, 2019, https://publichistory.iupui.edu/items/show/364. Published on Mar 1, 2018. Last updated on Apr 2, 2019.